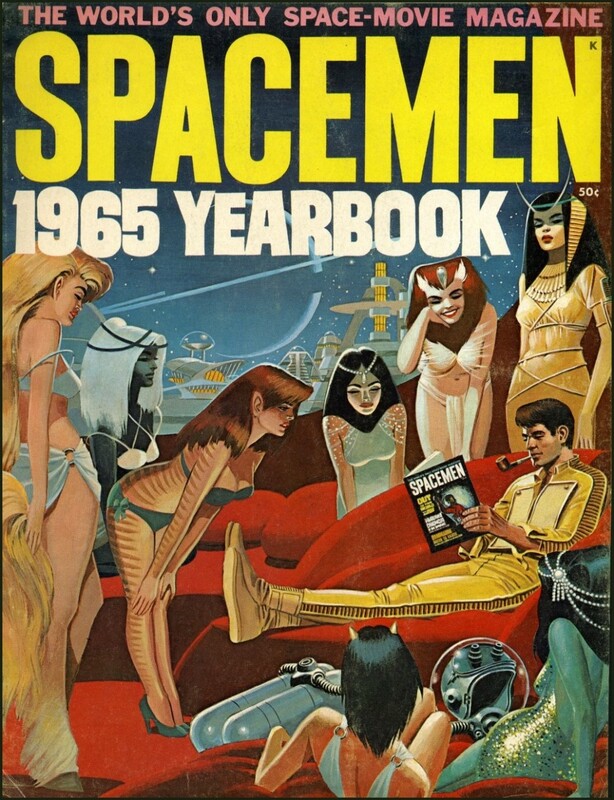 Spacemen Magazine was a relatively short-lived publication. It was published from July 1961 to July 1965 and was a spin off from the more successful “Famous Monsters of Filmland.” Both were edited by the late Forrest J. Ackerman and Published by James Warren. The cover art for the 1965 Yearbook was by well-known comic book artists Russ Jones and Wally Wood. This particular cover was unique because the magazine’s covers were usually a color photograph (still) from a film, or an artist’s rendering of some more sensationalistic aspect of science fiction. This cover, with its urbane space bachelor gives a rather obvious nod to Hugh Hefner. The magazine featured mostly photographs from, and articles about the Hollywood “Space-Age” films and television programs which usually took a rather fanciful view of outer space and the future (e.g. robots, alien invaders, space travel, etc. ).